Description: Seat of War in America. 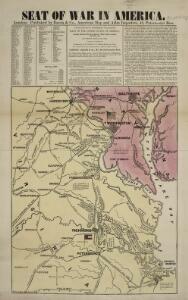 Published by Bacon & Co. in London, Seat of the War in America shows the region between Baltimore and Petersburg and the placement of troops and fortifications along the border between the Confederacy and the Union. It is notable how many batteries are placed around the Confederate capital of Richmond, as well as marking out the railway lines that connected the region. At the top of the map are publishing adverts for Colton productions, as well as a list of the Union and Confederate generals and a table detailing export amounts in 1860, with cotton being the largest figure.